The USDCHF slipped above 0.9230 yesterday but unable to stay consistently above that area and now traded lower around 0.9170. Although it’s too early to say that bullish correction is over, the bias is bearish in nearest term testing 0.9090 as we might have a false breakout scenario here. Immediate resistance at 0.9200. A clear break above that area would lead us to neutral zone in nearest term but only a consistent move above 0.9230 would give the bullish correction scenario another chance testing 0.9368. TheGeekKnows.com – Learn Forex Trading and view Daily EUR/USD Reviews. In the previous EUR/USD weekly review, we noted that the inflation risk remains a concern for the financial markets on the whole. An observation would be the apparent little effect the Japanese Earthquake had on the economic policy decisions of a number of countries. Looking at the EUR/USD daily chart above, we can see that the EURUSD is currently sloping downwards towards a test of the bottom channel trend line. As of now, it works out to be near 1.4 which is technically a potential strong support. The beginning of the week saw continued speculations regarding an interest rate hike due to the ongoing inflation risk of the Euro Zone. This probably brought about much demand for the Euro currency. Having said so, midweek began to display signs of a bearish fall out. Risk aversion from the Japanese Earthquake and its complications together with the Libya crisis probably exerted downward pressure to the EUR/USD. The upcoming EU economic summit resulted in apprehension too as traders speculate regarding the economic policies to be implemented. 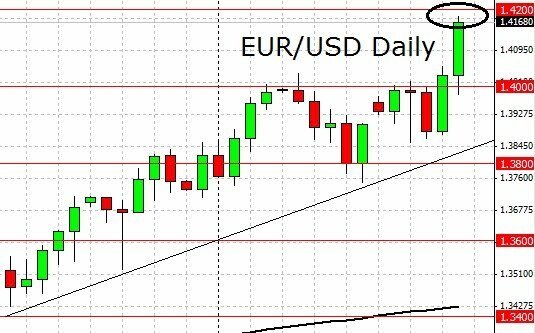 Towards the end of the week, positive developments from the EU economic summit and the threat of a bail out for Portugal brought about wild ranging movements to the currency pair. European leaders concluded in agreement regarding the restructuring of a bail out fund meant to resolve the Euro Zone budget deficit crisis. There was also talk on the European Stability Mechanism which is a permanent fund to help Euro Zone countries facing challenges. While this is an optimistic development, the woes of Portugal is threatening to drive risk aversion deep into the markets. With deficit cutting measures facing immerse opposition, speculations run wild that it is doomed to go down the road of a bailout. Investors feels that if this happens, it may expose further risks of other Euro Zone countries. Over in the US however economic conditions are still apparently improving. There were comments made by a Federal Reserve Bank President that the current quantitative easing policy should be reviewed if it is still required. While this is encouraging, one must remain aware that the US economy is still facing fundamental challenges such as a poor housing market pick up and strained employment markets. In fact banks in the US are still being closed due to the inability to continue functioning. Next week bring us more important economic data including the US Non-Farm Payroll. Caution is advised. In the previous EUR/USD weekly review, we noted that Eurozone leaders had reached an in principle agreement on a pact for the Euro to coordinate economic policies. In talks is the establishment of the new European Stability Mechanism. This would probably spark increased optimism as the markets hopes for a stabilized Euro Zone. Having said so, concerns probably lingered as there are still various troubled countries of the Euro Zone. Greece, Ireland, Portugal and even Spain whose ratings were cut by Moody’s recently. I have zoomed out the EUR/USD daily chart above and you can see that since Feb, we are experiencing a rather bullish uptrend. In the beginning of the week, a forex gap developed. This was probably due to the change of expectations towards the Euro Zone after the mainly successful Euro Zone leaders summit. 1.4 was tested again. Next the German ZEW Economic Sentiment came out lower than expected and this brought the EURUSD under 1.39. Furthermore the Japanese Earthquake also brought a wave of risk aversion across the markets. Equities were heavily affected. Soon the Yen started to climb in value as the possible shift of funds home by Japanese corporations to aid in the recovery sparked demand for Yen. Towards the end of the week, positive US economic data probably brought increased risk appetite to the currency markets. Furthermore the European Central Bank President Mr Trichet suggested that the ECB still intents to raise the interest rates next month as he was reported as saying that despite the current factors affecting the markets, he had nothing to add or remove in terms of his views. This definitely sparked increased speculation by currency traders on an Euro interest rate hike and the EUR/USD closed nearly at 1.42. It was reported that China ordered banks to put aside more cash for the third time in 2011. Increasing the reserve ratio is an action meant to combat the inflation threat. Unrealistic housing and food price increases are a potential economic and social problem. While most investors are probably numb by now, a number of them will probably still worry about the potential effects to the global economic recovery as China is a major economic power. Another observation to this action would be that the Japanese earthquake crisis seems to be rather inconsequential towards the decisions and policies of other countries. This may be an indication that the inflation risk is more critical. The increase in Yen value, an aftermath of the earthquake, threatens to bring the country’s export industry to an uncompetitive level. This may be a major problem. The Group of Seven G-7 countries jointly intervened to sell the Yen in hopes of bringing the value down. It is apparently working for now as Yen returns above 80. From a technical point of view, we remain in a bullish trend. While the 1.42 line is probably a strong resistance, close monitoring must be done as speculations of an interest rate hike for the Euro continues to fuel the bull machine. Among the usual important economic releases next week, brings us the EU Economic Summit. Be on a lookout for unexpected developments. We may be in for a rocky ride. You can find the list of the various economic releases in the Economic Calender below. 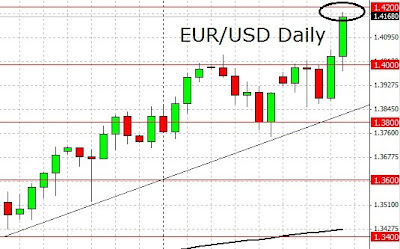 The EURUSD was volatile but indecisive yesterday. Price attempted to push lower but found a good support around 1.3860 and whipsawed to the upside and slipped above 1.4000 but still unable to make a clear break above 1.4000 – 1.4035 key resistance area so far. There are no changes in my daily outlook where overall price still trapped in range area of 1.4035 – 1.3740 and need a clear break from either side to see clearer direction. The bias is neutral in nearest term. Aggressive traders can short around 1.4000 – 1.4035 with tight stop loss. Immediate support at 1.3900. A clear break below that area would change the intraday bias to bearish retesting 1.3860. On the upside, a clear break above 1.4035 would continue the bullish continuation scenario targeting 1.4150 – 1.4281 this week. The EURJPY had a significant bearish momentum yesterday, broke below the triangle formation as you can see on my h1 chart below suggests a bearish technical bias at least targeting 112.50 in nearest term before testing 110.80 in longer term as the upside scenario might have failed now after the failure to maintain position above 114.00. Immediate resistance at 113.50. A clear break above that area would lead us to neutral zone in nearest term testing 114.00 but only a clear break above 114.68 would continue the bullish scenario targeting 116.35. Note that the price movement seems to be remains under the influence of Tsunami impact and nuclear crisis in Japan. Although risk aversion sentiment will likely to dominate and keep support broad Yen strength, this kind of sentiment can change quickly anytime. The GBPJPY had a significant bearish momentum yesterday, bottomed at 129.17 and closed at 128.84. The bias remains bearish in nearest term especially if price able to make another strong break below 129.17 targeting 127.50 even 125.50 in longer term. Immediate resistance at 131.00. A clear break above that area would change the intraday bias to bullish testing 132.50 which could be a threat to the bearish scenario. Note that the price movement seems to be remains under the influence of Tsunami impact and nuclear crisis in Japan. Although risk aversion sentiment will likely to dominate and keep support broad Yen strength, this kind of sentiment can change quickly anytime. The AUDUSD had a significant bearish momentum yesterday, clearly broken below the rising wedge formation as you can see on my daily chart below, confirms the bearish correction/reversal scenario after hit all time high at 1.0256. The bias is bearish in nearest term but note that we probably have a good support around 0.9800 and need a clear break below that area to continue the bearish scenario targeting 0.9540. Immediate resistance at 0.9965. A clear break above that area would lead us to neutral zone in nearest term testing 1.0100 but only a clear break above 1.0100 could cancel the current bearish scenario and open the door for another bullish attempt aiming for new all time highs. The GBPUSD had a bearish momentum yesterday, bottomed at 1.5978 but closed higher at 1.6070. 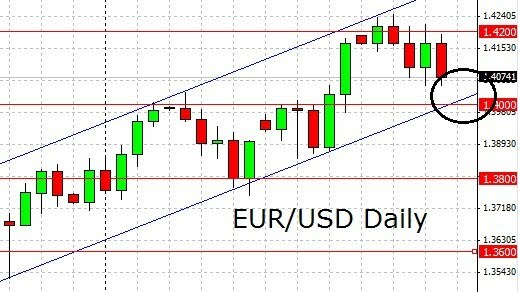 The bias is neutral in nearest term but I think the overall pressure remains to the downside now as price still able to stay below the bullish channel as you can see on my daily chart below. Immediate resistance at 1.6135. A clear break above that area would change the intraday bias to bullish testing 1.6200 and would give the bullish scenario retesting 1.6300 another change. On the downside, 1.5950 is the nearest bearish target and need a clear break below that area to continue the bearish scenario and activate my bearish mode at least targeting 1.5750 region. The USDJPY made a significant bearish momentum yesterday, broke below the triangle formation as you can see on my daily chart below. This fact confirms the bearish scenario retesting 15-year low at 80.30. Immediate resistance at 81.20. A clear break above that area would lead us to neutral zone in nearest term testing 82.00 but I think the overall technical bias should remain to the downside. As a 15-year low level, 80.30 could be a strong support at this phase so we must pay attention to that support level. The USDCHF made a significant bearish momentum yesterday by clearly broken below the range area after two weeks of consolidation as you can see on my daily chart below. This fact confirms the bearish continuation scenario targeting 0.9100 – 0.9000 this week. On the upside, only a movement back above 0.9230 would be a threat to the bearish continuation scenario and lead us to neutral zone as direction would become unclear.